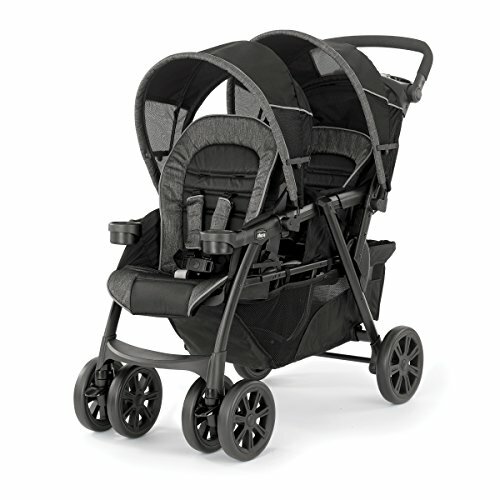 You may have already heard that the Chicco Cortina is one of the best single traditional strollers you can buy. So what if I told you that you could now get the Cortina as a double stroller? Yes, you can! Chicco offers the Cortina in a tandem version called the Chicco Cortina Together. Versatility is a high point on this Chicco double stroller because there are four different ways to configure the seating. Parents love that they can use TWO KeyFit or KeyFit 30 Infant Car Seats in this stroller to turn it into a Chicco travel system. 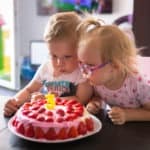 Use for different age siblings or twins. If you use just one car seat, you have the option of using either the front or the back seat. The fourth option is when you have two older children who do not need a car seat. As a mom or dad, you know how important it is to have several options available! By the time you finish reading this review, you will understand how fantastic and well-made the Chicco Cortina Together tandem stroller really is and why it is getting such rave reviews. Let’s start by getting a rundown on the features. 3 What are the seats like? 4 What is the fold like? 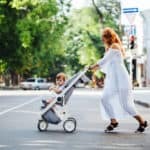 9 Where can I buy this Chicco double stroller? A double stroller has got to be able to take the weight of one or two wiggle worms plus a car seat or two, not to mention any other bags and necessities you take along with you. To be able to last a long time under these conditions your stroller’s got to be strong. 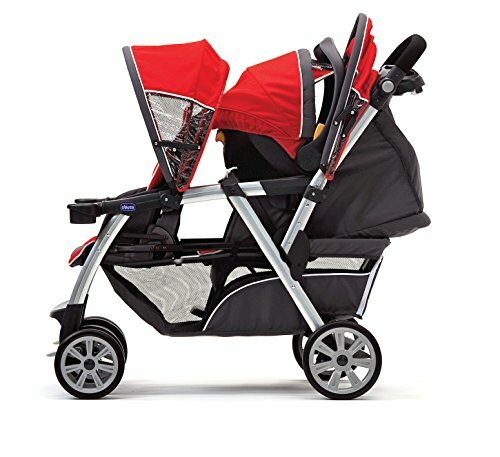 To live up to these expectations, the Chicco Cortina Together has an anodized aluminum frame with a unique tubing profile, which makes it 15% lighter than most tandem strollers in its class. One family was very impressed with this stroller as they took it with them to Europe. They hauled it on and off planes and trains, as well as up and down cobblestone streets as well as off-road. Wow! The seats can accommodate up to 40 lbs each and are tall enough for children up to 5 years old to sit comfortably under the sun canopies, so long as they are within the weight limit. The seats are 13 ½ inches wide and roomy and have adequate padding for your child’s comfort. The back seat reclines nearly all the way and has a bassinet enclosure and the front seat reclines only slightly. Then, of course, you have the option of having a car seat installed, making this stroller into a travel system. For one infant, install the car seat in the back. Do you have twins? 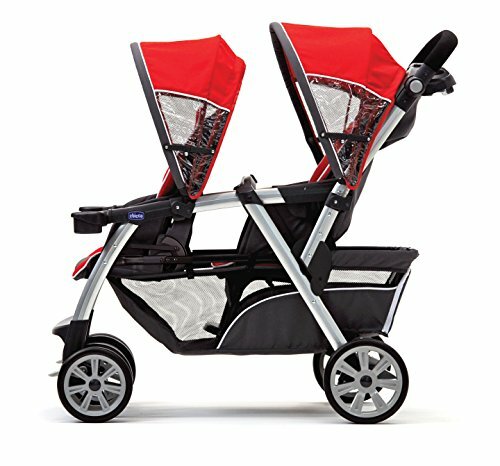 This is one of the best strollers for twins by using two Chicco KeyFit or KeyFit 30 car seats in the front seat and back. The front seat has a front fold so that you can install the car seat there. And best of all, the car seat sits right in there with no adapters or straps needed. That’s nice! A Cortina Together also comes with an interchangeable child’s bumper bar and cupholders. The bumper bar is covered with fabric, not foam padded, which was a huge plus for one owner. The bumper bar does not swing out, though; it has to be completely removed from both sides for your child to get in and out. So keep in mind that there is not a cup holder for both front and back seat – you have to swap them, taking turns with it, and that has drawn some criticism about the product. Each seat is also equipped with an adjustable sun canopy. The rear canopy has a peek-a-boo window and the front canopy can move up and down to block any angle of the sun. What is the fold like? This Chicco double stroller is easy to fold and only slightly larger than a standard stroller once folded, making storage in the trunk space more compact. The Cortina Together weighs in at about 34 pounds, a little lighter than many double strollers in its class. But to fold it, you first have to fold the sun canopies, then you pull on a lever on the handle and press down with your foot on the basket and pull up. Then it ends up in a standing fold. While it is flat, it does take up a lot of space. One mother puts it in the back of her Honda Odyssey and can even squeeze in a few bags of groceries around it. For safety, the padded five-point adjustable harnesses are easy for Mom and Dad to unclasp, but too difficult for your little ones. The braking system on this Chicco double stroller is a one-touch braking bar that is easy to get to even with the seat fully reclined and the basket full. The three-position adjustable handle makes it more comfortable for parents of different heights. The lowest position is at 38 inches from the ground to handle and the tallest position is at 42 inches, and owners love this feature. The Cortina Together has a large storage basket underneath the seats with a zippered enclosure on the outside for easy access when the seat is fully reclined. Get to your things at any time without having to wait for baby to wake up or take your car seat out. You get two parent cup holders and a snap shut enclosed compartment to keep small things like your keys or coins. Reviews have been solidly positive for the Cortina Together, giving it high marks. This Chicco double stroller gets frequent praises for the one-handed maneuverability and smooth ride. Parents really like the versatility of being able to place a car seat in either the front or back seat without having to deal with adapters or straps. Several moms mention this incredibly efficient feature. The durability and sturdiness have also gotten compliments. The sun canopies have had some disapproving remarks made about it. While the front canopy is removable and the back one includes a peek-a-boo window, the size of these “floating” canopies is small and a bit flimsy. The front canopy rotates all the way down, and if your toddler discovers this, he or she could have a field day playing around with it. The front canopy also gets in the way when folding this Chicco double stroller. Some parents commented that they don’t like that the back seat does not have a cup holder and the front seat only slightly reclines. The back seat does not fully recline flat, either, but it does lie flat enough for a newborn to rest comfortably. Lastly, some Chicco Cortina Together owners are displeased that despite the fact that this stroller folds compactly for its size, it still does not fit into some vehicles like Mazdas and VWs. 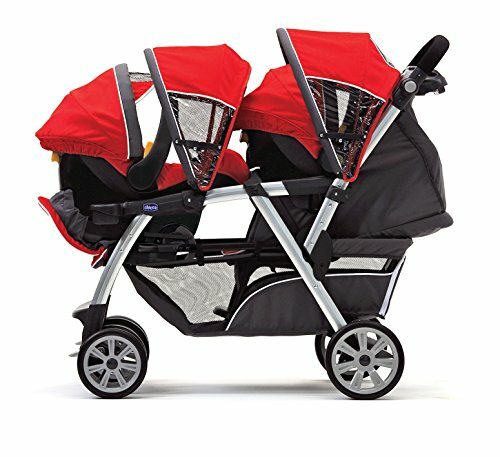 Where can I buy this Chicco double stroller? Right now Amazon has the black “Ombre” in stock for around $300. The red “Element”, which is now discontinued, is still available, but the price is getting higher. 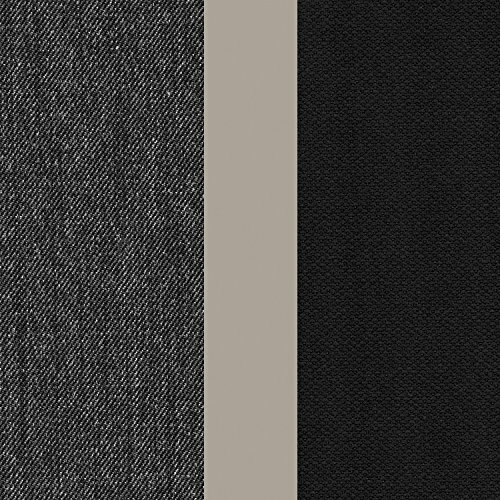 Other color schemes are available exclusively at BuyBuy Baby or BabiesRUs, so check them out if you want something other than black. Just think how happy you’re going to be getting your brand new Chicco double stroller. It is a safe bet with so many positive reviews from parents who are like you and want a safe, quality product for their children that looks fantastic.